– Do you know the human cost of the food you eat? 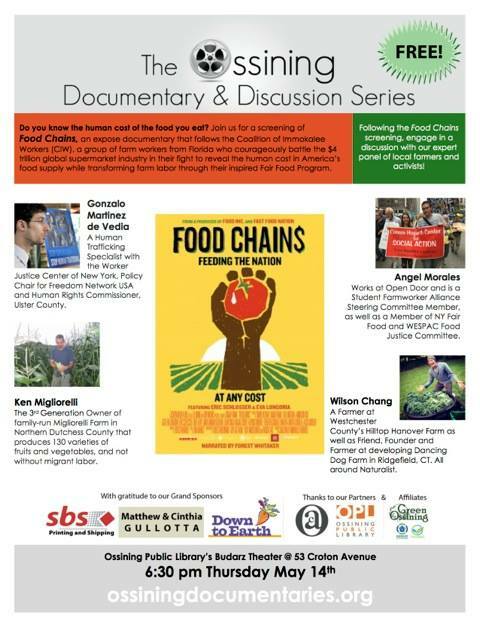 This month’s screening of Food Chains is an expose that follows the Coalition of Immokalee Workers (CIW), a group of farm workers from Florida, who courageously battle the $4 trillion global supermarket industry in their fight to reveal the human cost in America’s food supply. Following the film, join us for conversation with our exceptional local panelists: Gonzalo Martinez de Vedia, Human Trafficking Specialist with the Worker Justice Center of NY. Policy Chair for Freedom Network USA and Human Rights Commissioner, Ulster County; Ken Migliorelli, 3rd Generation Owner of family-run Farm in Northern Dutchess County which produces 130 varieties of fruits and vegetables, and not without migrant labor; Wilson Chang, Naturalist, and Farmer on both Westchester County owned Hilltop Hanover Farm, as well as Dancing Dog Farm in Ridgefield, CT. Finally, Angel Morales who works at Ossining’s Open Door; also a Student Farmworker Alliance Steering Committee Member and Member of NY Fair Food and WESPAC Food Justice Committee. This is a learning experience about the connection to the affects of where we choose to buy our food. For more info: www.ossiningdocumentaries.org or on Facebook.